Calvin L. Smith: Polls, Israel and Can a Christian Be Demon-Possessed? Hi Calvin - It would be useful if you could some guidance as to what you consider to be worthy of serious consideration. I appreciate you are very busy and don't wish to waste your time, nor do I wish to antagonise you with 'unworthy' comments. Unworthy of serious consideration: an unnecessarily pejorative approach preferring polemics over eirenic scholarship. Just not interested... bigger fish to fry. Out of interest, do you think those results are more or less representative of Christians in the UK / further afield generally? Which one did you vote for? I just used this survey for a chapter I wrote in my latest book on Latin American Pentecostalism, due out later in the year. 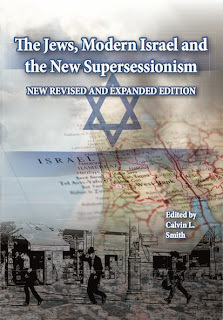 Among other things I looked at Zionism among Latin American exogenously-influenced classical pentecostals, neopentecostals and autochthonous Pentecostals. Not the variety in views I expected to find, with Zionism quite strong. I would like to recommend the reading of an article I ran into on Google entitled "Pretrib Rapture Politics" which I found most interesting and informative. Based on previous posts, I would guess that you go for b. I think, though, that politically you're more pro-Israel (as in the institution of the state of Israel in its modern incarnation) than you are necessarily theologically, yout theological concern being more with the Jewish people, rather than the state itself. However, my guesswork could be way off the mark! I know, but I was trying to narrow it further. To b.
I think I could make a case for voting for each of those statements Calvin ;0). Point (a) could be taken in either a positive or a negative sense. Point (b) and (c) depend on what is meant by 'God's chosen people' - with careful clarification I can just about accept that. I voted for (d), although I am not in total agreement with the final part of that statement. The State of Israel exists because God has allowed it to, and it must have at least some theological significance even if it is not living according to God's directive will. God's purposes are complex and even his enemies can become instruments of judgement.